When Kael and Jiminy returned to Barrelhead, the villagers gave them a hero's welcome. During the feast thrown in their honour, they met Josiah, a half-elven ranger who'd heard about the goblins, but arrived too late to be join the raid. That evening the the three decided to join forces, and that they would follow up on a story they heard from a travelling merchant. Farms and wanderers have vanished in great numbers in the Arrandmoors. The rumours said there was a giant on the lose, and that it'd eaten least one hundred and fifty people. The heroes figured this had to make for some thrilling heroics, and besides, the giant could hardly be as terrible as the stories would have it. If indeed there was a giant at all. The moors lay about six days travel days west, across the Kaiserfjord, and as the companions drew closer to their goal the tales grew taller. Some said the monster had taken at least three hundred people, and that it wasn't a giant at all, but a fierce troll. 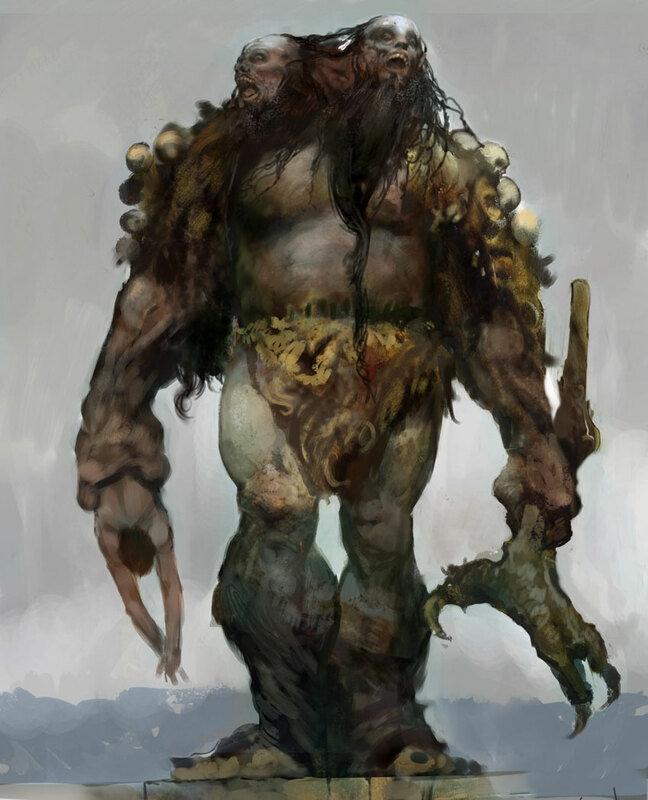 Others again that it was a two headed ettin. They reached the Arrandmoors close to sundown, and camped in the ruins of a farmhouse. It looked like something big had grabbed the windowsills on the second floor and ripped the whole wall out. As they found deep furrows in the floor planks, as if someone had been dragged out of the house, the adventurers quietly started to doubt the merits of their mission. That night, while Kael sat watch, a throaty roar carried across the moors. Jonah climbed the roof of the building, and as more roars ripped the night, he spotted a small cluster of lights on the slopes a ways off. The lights were moving as if in formation, then suddenly a large black shape moved across them. The lights scattered momentarily, and when they gathered again, a few had gone out. This ominous dance repeated a few times, and all the while the three spectators could hear the frightful roars. At last the lights were gone, and the moors went quiet again. In the morning, when the heroes found the site of the nocturnal debacle, they came across the corpses of eight legionnaires, their bodies battered, crushed, and thrown about as if by a terrible force. The ranger easily picked up the trail of the monster - with its feet being more than a yard long, even the Gnome could have tracked it - and before noon they had located the it's lair. After a short council, Josiah volunteered to sneak into the ferociously rank cave to see what they were up against. As he peaked around a bend, he saw the two-headed brute leaned against the cave wall. His left head snored loudly, while the right head was busy exploring the contents of it's massive nose. Not wanting to face the monster alone in the dark, the ranger stealthily retreated into the daylight again. Another council - the merits of seeking out a comfortable inn was explored briefly - resulted in a battle plan, and Josiah snuck back into the cave again. This time he took carefully aim, and placed a shaft square right above the right ear of the head that was awake. Immediately after, he ran as fast as his boots would hold. Outside, they had strung a rope across the mouth of the cave. When the ettin emerged into the sunlight, he tripped on the rope and fell on his faces. Jiminy cast a spell, hypnotising it to count to a thousand, and though the left head struggled to follow the magical instructions, the right head, unaffected by the spell, tried to get up. The dogs attacked, barking and biting, Jiminy pelted the monster with rocks, and Josiah shot arrow after arrow into its flesh. As soon as the beast emerged, Kael quaffed a Potion of Heroism, and fueled by it he charged. He hit the ettin hard once, twice, before the ettin struck him a blow that would have killed the man where he stood, had it not been for the potion's power. By now the monster was gravely wounded, and when Kong leapt up on it's chest and ripped it's right throat out, it fell to the ground dead. That night the three slept soundly in the ruined farmhouse, well pleased by their efforts, and laden with treasure from it ettin's lair. Game Master's notes: Three 1st lvl. characters should be no match for a 10 HD monster, but it had already been in a fight with a legionnaire patrol. The players also played it smart, luring the ettin into a daylight ambush. Still, had it not been for the potion they reclaimed from the goblins in the last episode, Kael would not have made it back from the moors. Also, the ettin now graces my screen. I'm quite pleased with how it's turning out. Sounds like a great session. The player's played smart, too, which is always good to see. Yeah, we had fun, and it was a really good fight. Its been a while since I've been able to say that. I have to say that I'm truly sorry for the atrocious penmanship in this post. I find its hard focusing on writing while making sure the puppy doesn't pee on the floor. Hopefully this'll get better as I adapt, and as Bruiser gets better at controlling his bladder.